NXP has expand its Autorsar solutions. The company offers software packages for the MPC56 and MPC57 families. The complexity in automotive software development led the industry to develop the Autosar standard, an open automotive software architecture that simplifies the development process of electronic systems. The software for the MPC56 family is free-of-charge. It comprises Autosar MCAL and an operating system. For the MPC57 family customers have to pay, however less than before. “The largest barriers to getting products to market are software, research, and development and their associated costs. With the expansion of our software solutions for Autosar and the MPC57 software development kit we continue to expand access for all customers while further affirming our commitment to NXP’s 15-year longevity program for Automotive Power Architecture products,” said Paul Lee from NXP. The MCAL software includes driver software for data reception and transmission over CAN networks. Digital I/O driver for reading and writing to/from corresponding channels (pins), ports, and channel groups are available, too. Of course, LIN and PWM driver programs are also in the Autosar software. NXP’s automotive-grade software products are developed according to Misra and Automotive Spice compliant development processes. 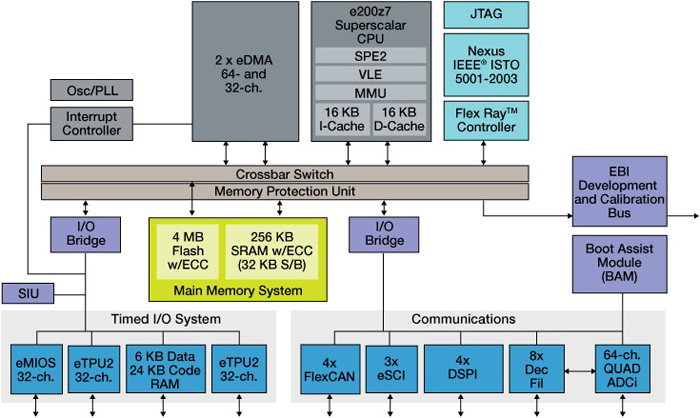 For software that targets MCUs designed for NXP’s SafeAssure program, the development process has been enhanced to comply with the ISO 26262 standard on functional safety. NXP software can be integrated with other software developed for the Autosar ecosystem and with Autosar configuration tools offered by third parties. “NXP has provided Autosar solutions, implemented with the highest quality standards, for more than 10 years. Reducing the price for our Autosar software will provide our customers with another option to accelerate their own software development,” said Andreas Both from NXP.